Varaha avatar (वराह) is the third avatar of the Vishnu which is in the form of a boar. When the demon (asura) Hiranyaksha stole the Earth (personified as the goddess Bhudevi) and hid her in the primordial waters, Vishnu appeared as Varaha to rescue her. Varaha slew the demon and retrieved the Earth from the ocean, lifting it on his tusks, and restored Bhudevi to her place in the universe. Jaya and Vijaya are the two gatekeepers (dwarapalakas) of the abode of Vishnu (Vaikuntha Lok). According to the Bhagavata Purana, the Four Kumaras, Sanaka, Sanandana, Sanatana, and Sanatkumara, who are the manasaputras of Brahma (sons born from the mind or thought power of Brahma), were wandering across the worlds, and one day decide to pay a visit to Narayana – the form of Vishnu that rests on Shesh naga. The Sanat Kumaras approach Jaya and Vijaya and ask to be let in. Now due to the strength of their tapas, the four Kumaras appear to be mere children, though they are of great age. 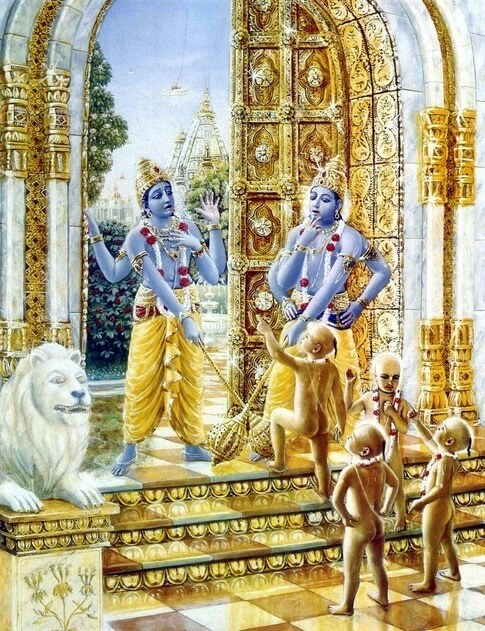 Jaya and Vijaya, the gate keepers of the Vaikuntha stop the Kumaras at the gate mistaking them as children. They also tell the Kumaras that Sri Vishnu is resting and that they cannot see him now. 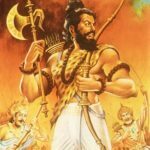 The enraged Kumaras tell Jaya and Vijaya that Vishnu is available for his devotees any time, and cursed both of them that they would have to give up their divinity, be born as mortals on Earth and live like humans. So now they were born on earth as Hiranyaksha and Hiranyakashipu to the sage Kashyapa and his wife Diti and were one of the Daityas, a race of demons originating from Diti. Since Hiranyaksha had not included the boar in the list of animals that would not be able to kill him, Vishnu assumes this form with huge tusks and goes down to the primordial ocean. Varaha has four arms, two of which hold the Sudarshana chakra (discus) and shankha (conch), while the other two hold a gada (mace), a sword, or a lotus or one of them makes the varadamudra (gesture of blessing). Varaha may be depicted with all of Vishnu’a attributes in his four hands: the Sudarshana chakra, the shankha, the gada and the lotus. In the Bhagavata Purana, Varaha emerges as a tiny beast (a size of a thumb) from the nostrils of Brahma, but soon starts to grow. Varaha’s size increases to that of an elephant and then to that of an enormous mountain. The scriptures emphasize his gigantic size. The Vayu Purana describes Varaha as 10 yojanas (The range of a yojana is disputed and ranges between 6–15 kilometere (3.7–9.3 mi) in width and a 1000 yojanas in height. He is large as a mountain and blazing like the sun. Dark like a rain cloud in complexion, his tusks are white, sharp and fearsome. His body is the size of the space between the earth and the sky. His thunderous roar is frightening. 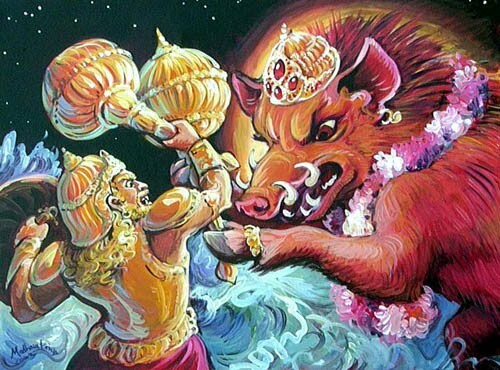 In one instance, his mane is so fiery and fearsome that Varuna, the god of the waters, requests Varaha to save him from it. Varaha complies and folds his mane. In the ocean, Varaha encounters Hiranyaksha, who obstructs his path and challenges him for a duel. The demon mocks Varaha as the beast and warns him not to touch earth. 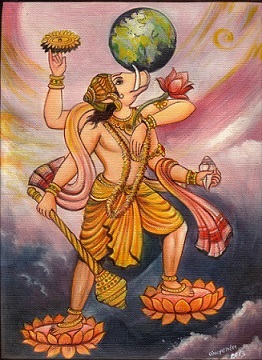 Ignoring the demon’s threats, Varaha lifts the earth on his tusks. Hiranyaksha charges towards the boar in rage with a mace. The two fiercely fight with maces. Finally, Varaha slays the demon after a thousand-year duel. Varaha rises from the ocean with the earth in his tusks and places her gently above it in her original position, as the gods and the sages sing Varaha’s praises. Further, the earth goddess Bhudevi falls in love with her rescuer Varaha. Vishnu – in his Varaha form – marries Bhudevi, making her one of the consorts of Vishnu. In one narrative, Vishnu and Bhudevi indulge in vigorous embraces and as a result, Bhudevi becomes fatigued and faints, sinking a little in the primordial ocean. Vishnu again acquires the form of Varaha and rescues her, reinstating her in her original position above the waters. Reptiles gradually evolved to form the semi-amphibians, which later evolved to form first complete animals, which could exist purely on land. They could bear children and walk on land. Varaha, or the boar was the third Avatar of Vishnu. Interestingly, boar was the first mammal to have whose teeth were at the front, and so didnt swallow food but eat more like humans. Sri Varahaswami Temple in Tirumala, Andhra Pradesh. 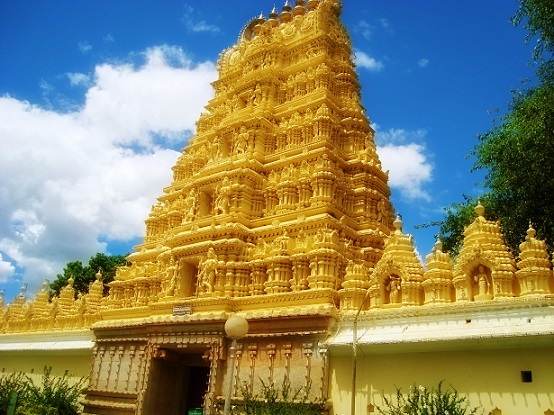 It is located on the shores of a temple pond, called the Swami Pushkarini, in Tirumala, near Tirupati. The region is called Adi-Varaha Kshestra, the abode of Varaha. 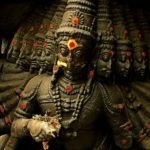 Another important temple is the Bhuvarahaswami Temple in Srimushnam town, to the northeast of Chidambaram, Tamil Nadu. It was built in the late 16th century by Krishnappa II, a Thanjavur Nayak ruler. Credits: Phot Credits to the real artists and owners.